A pioneer in electric adjustable height desks GeekDesk has not kept pace with the innovations and sheer spectrum of choices that newer manufacturers are bringing to the fore. Judging by site traffic readings, the lack of a phone number for customer service or sales, and the lack of availability through trusted channels like Amazon, it appears that GeekDesk is getting ready to sunset its offerings. Capable of very heavy desktop loads compared to some of the lighter variable-height desks. 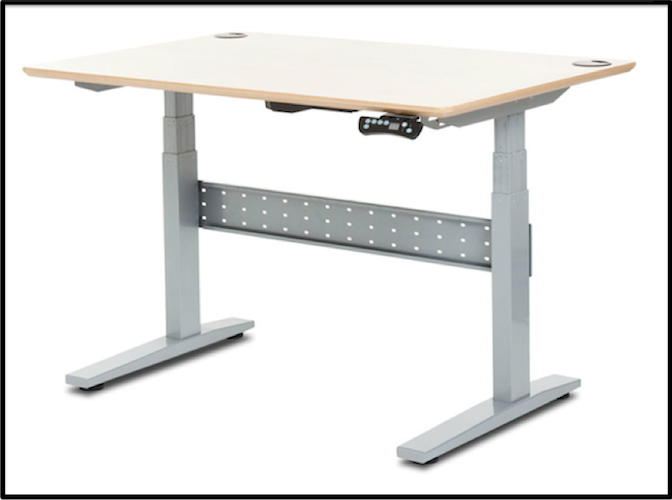 Decent amount of under-desk freeboard for mounting an adjustable ergonomic keyboard tray. Frequent long lead times for delivery, quoted up to 5 weeks but reported as long as 60 days. Bases lack width-adjustability. Very limited choices of colors and tabletop sizes. Slowest lift speed of the pack while noisier than one would expect for a 1.1"/sec travel. We don't expect the GeekDesk to disappear from the market anytime soon. Its weight rating and height adjustment range make it an acceptable stand up desk, and few owners will be dissatisfied with its basic performance. But with a growing list of competitors unveiling newer, quieter, stronger, faster standing desks, coupled with GeekDesk's relative stagnation, it is far from the best choice for the money. 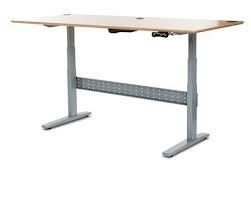 New customers should consider other standing desks in the market, which will give you more for the money. GeekDesk - despite the nerdy moniker - was a highly popular choice of standing desk for many years, with little competition from established furniture manufacturers. All that has changed now with the wave of new electric standing desks flooding the market and creating rough seas for this bijou company. 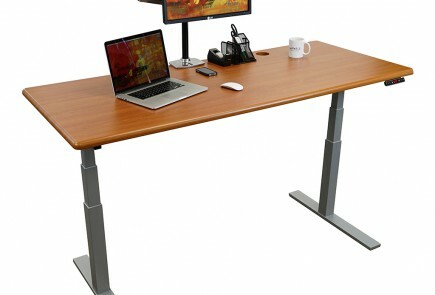 As a lifestyle business for its founder, with no dealer distribution channel, no earth-shattering new product enhancements in many years and persistent production delays, GeekDesk has ceded its place in the pecking order to other stand up desk makers we review on this site that have brought innovation, choice and strong financial backing to bear. With the advent of new, higher-tech products ranging from the StandDesk Pro on the low end to the iMovR Lander on the high end, consumers are rightly expecting more capable desks with improved additional features. For the amount of money a new standing desk costs, "adequate" is no longer good enough, and at this stage of market maturation, attributes such as quick delivery, first-class customer support and extensive warranty coverage are more sought after. Indeed there are signs that GeekDesk has already started folding up its tent, with its site traffic diminished to nearly nothing, a phone number replaced by a contact us form, and no availability of the product through Amazon. The GeekDesk line comes down to two options. The GeekDesk v3 is their basic model, and has a similar feature set and price range (the desk starts at $749) as other mid-tier desks like the UpLift, S2S, and Jarvis—all based on the same commodity electric standing desk base made in China by Jiecang. It adjusts in height with a simple two-button controller. For $200 more, the GeekDesk Max comes with some performance improvements, and a more advanced LED controller with programmable presets. Other Chinese-made brands like StandDesk Pro and the Autonomous SmartDesk have nibbled away at GeekDesk from the low-cost end of the market, while higher-quality American made standing desks have drawn away many of the customers looking for a premium desk. Regardless of which model you choose, GeekDesk has a garden-variety height range of 23” to 48.75”, within ANSI/BIFMA standards for sit-to-stand desks. ANSI/BIFMA is a decent starting point for desk height, but there is a case to be made for desks that have a higher max height. First, taller users who want to outfit their stand up desk with a treadmill—which adds about 6" of height to any user—will find the GeekDesk too short to accommodate their walking needs. A tall max height also contributes to greater desk stability. That's because at greater heights (not necessarily the max height, mind you) there is more overlap between the telescoping leg segments, mitigating the shakiness that occurs when a desk is raised to standing or walking height. New generations of desks can climb up to 55", which lets just about any user stand or walk in confidence; these include all the iMovR models such as the Energize, Cascade and Lander desks. Width adjustment is also another category that GeekDesk has thusfar ignored: Both Geekdesk models come in a small frame or large frame version (see table below), rather than the width-adjustable bases found on newer desks (e.g. Energize, StandDesk, Jarvis, UpLift). The frames can be ordered in either silver or black. Plenty of users who become attached to their own desk tops want to take their hardwood or granite top to standing height. Plenty more will find themselves wanting to swap their current top for one of a different size down the road. GeekDesk effectively denies users that option. By using fixed-width bases GeekDesk has chosen a path taken only by a few of today's leading standing desk brands, including Humanscale with their Float Table and Varidesk with their ProDesk 60 Electric. We also hope you're patient: Among electric standing desks, the GeekDesk is the slowest of the pack. Its 1.1 inch-per-second lift speed means that taking it from sitting to standing will take 25 agonizing seconds. A typical electric standing desk will have an adjustment speed of 1.5"/sec, so the GeekDesk's lethargic pace is a major disappointment. Despite its slowness, the GeekDesks can still rack up quite a din. While speed demon Mod-E (at 2.0"/sec) is much noisier at 75dB, other quick desks like the 1.7"/sec iMovR Vigor base are whisper-quiet in comparison (only 42 dB, barely above typical office background noise). With the rule of thumb being the faster the desk, the noisier, GeekDesk delivers the lowest lift speeds while producing mid-range decibel counts around 69 dB. As we discuss in our lab testing of the Jiecang standing desk base, this commodity component from China leaves a lot to be desired in the stability department, and we tested a much newer version of the base that GeekDesk is still using. Older versions of the Jiecang base had such poor stability they required the "knee crusher" crossbar between the bottom tubes of the lifting columns. 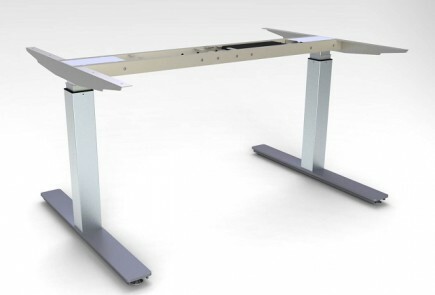 Almost all modern-day standing desk manufacturers have moved away from stability bars like this and instead run crossbars across the top end of the lifting columns, also securing to the desktop for extra rigidity. This leaves the desk more aesthetically pleasing, as well. Each GeekDesk model can be purchased base-only (a fixed-width version of the Jiecang base) or with one of GeekDesk's own table tops, which come in two flavors. The black laminate desktop comes with black vinyl edging. The beech veneer desktop is finished with a UV hardened lacquer and profiled edges. A carbonized bamboo option is also available, though that would take the price of the desk up by at least another $150, and anyone considering a bamboo standing desk top should read our article on the ecological scourge it has created in China. You can choose from two desktop sizes for the large frame and one size for the small frame. A new rubberwood option was added last year but note it requires 6 to 8 weeks for delivery compared to relatively fast shipping on the other options. We're unimpressed with typical laminate desks, which lack the durability and aesthetics of more modern finishes. Vinyl edge banding, for example, has a tendency to delaminate and peel off after a few years. For the most durable and cost-efficient table tops, we like to turn to 3D lamination, which hermetically seals the desk in a moisture-impervious finish that lasts years and looks great. Currently, this advanced lamination style can only be found on iMovR's and Anthro's stand up desk options. Again, compared to the extensive catalogs of competing products, GeekDesk's offering is a bit reminiscent of the Ford Model-T.
A desk's warranty is an indicator of the quality of its componentry. Frankly, the GeekDesk's is rather disappointing: just 5 years on the steel frame, 2 years on moving parts, and no warranty on the desk top. This is especially bad for the GeekDesk Max, which shares the top shelf with long-lived products that feature a longer and more robust warranty. This is another big distinction between Chinese-made options and American-made standing desks with at least ten year warranties. The warranty on the GeekDesk frame is 5 years, and the motors and electronics are covered for two years. This is comparable to the warranty on the ModTable Mod-E, albeit far shorter than premium brands like iMovR's (ten years) and Humanscale's (fiften years). 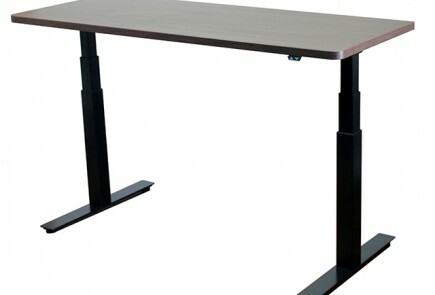 GeekDesk charges $125 for standard shipping to the continental United States. Max. Lift Capacity 275 lbs. 335 lbs. Frame Dimensions Large Frame 55.1"
Small Frame 39.4" Large Frame 55.1"
I bought my first Geekdesk in 2011 for use in my office at work and loved it (still do). It is beautifully made and finished, quiet, reliable, easy to use, really everything one could want. I am a huge fan of standing desks – my back feels MUCH better than it did when I had to sit all day! So when it came to buying an adjustable standing desk for home, it was a no-brainer – I went to Geekdesk without looking at anything else. And I must say have been a bit disappointed with the second one. It (the v3 model with a large top) will works well and does the basic job, but some of the fine details and quality that I valued in my first Geekdesk are missing in this one. In no particular order: (1) I spent extra ($150) for the “carbonized” bamboo top at home because I liked the look of the vibrantly patterned wood. In the piece that I received, the appealing pattern is there, but of the two sides, top and bottom, the bottom is much more distinct and “pops” more; and you can’t see the bottom when it’s assembled. Why not turn it over? Because the bamboo is so hard that the company thoughtfully pre-drills the mounting holes for you. The holes were drilled on the bottom (and the wood is VERY hard; so even if I wanted to put up with six empty holes on the top of the desk, I would not want to have to drill them. The bottom they chose is still the bottom. (2) The finish of the wood top of the first one (Beech veneer) is beautiful – smooth and even. The finish of the bamboo one is good almost everywhere except for an area (about 3” x 6” in) closest to the front of the desk; an area of small nubbly blemishes, flattened bubbles in the finish, it looks like. This makes for a rough surface that I never fail to notice. Is it a big deal? No. Is it slightly annoying? Yes. Should it be there? No. (3) The motorized lifter on the first desk is very quiet, and the switch – actually two small raised rocker switches side by side – very easy to operate without looking down (the switch box mounts underneath the top surface) at them. The newer motor makes kind of whiney sound it is operating, and the switch mechanism is decidedly cheesier looking and feeling. The up-down maneuver is done by pressing one of the two almost flat, pressure-sensitive areas on the switch box. It is probably possible to get used to the difference in the up and the down by feel alone, but I still fumble with it. My practice is to stand for a couple of hours, sit for an hour, stand, etc., in other words, I use the up-down feature frequently. Again, a big deal? No. But a let-down from the ease and quietness of the original. My bottom line: still a good product, but not up to the quality I had expected. I would not reflexively buy another one the way I did this one – I’d comparison shop. And I would do a good deal more talking with the production people to try insure that I was getting the highest quality before they shipped it. Finally, I’d be more willing to spend the not inconsiderable effort (it is large and heavy) to box up and send back the top, even given the cost in terms of time and hassle, and get at better one. Caveat emptor. I spent more time than I needed to researching standing desks before I decided to purchase a Geek Desk, and I am glad I did. Well worth the money and much cheaper than the Up Desk, but no value is downgraded by going with a Geek Desk (that was my worry). I got the Carbonized Bamboo medium top with a Geek Desk Max large model. The unit is beautiful and smooth in its up and down functionality (no shaking). Plus, you get the preset options with the Max as well as one touch release…and the desk continues to move to your preset heights (unlike the Up Desk). All together, it was around $1200. Supports up to 275+ lbs!